00:21:00 Makes 8 servings, 2 crab balls each. Makes 8 servings, 2 crab balls each. 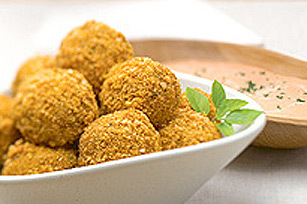 Ready in about 20 minutes, these crab balls are the perfect treat to serve those unexpected guests. Preheat oven to 400°F. Beat eggs, milk and Miracle Whip in medium bowl with wire whisk until well blended. Add stuffing mix and crabmeat; mix well. Shape into 16 balls; roll in coating mix until evenly coated. Place in 15x10x3/4-inch baking pan. Bake 6 min. or until heated through. Serve with Pepper Sauce for dipping, if desired. Combine 1/2 cup Miracle Whip Spread, 1/4 cup seafood sauce and a dash of hot pepper sauce. Cover and refrigerate until ready to serve. Serving Size Makes 8 servings, 2 crab balls each.